Vanderbilt Research News published a new story this week on the work of RASL members Jing Fan, Nilanjan Sarkar, and Lorraine Mion. See the full story here and watch the video below. 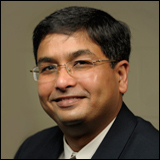 RASL Director Nilanjan Sarkar is the new chair of the department of Mechanical Engineering at Vanderbilt University. Dr. Sarkar accepted the position of chair beginning in the Spring semester 2018, following the distinguished tenure of Dr. Robert Pitz, who served as department chair for 18 years. More details are available here. Lian Successfully Defends Dissertation, Now Heading to Facebook! Congratulations to Lian Zhang who successfully defended her dissertation on April 20! Lian’s work on collaborative virtual environments and artificial intelligence has led to a number of publications. Lian has accepted a position at Facebook and will begin work there in May. 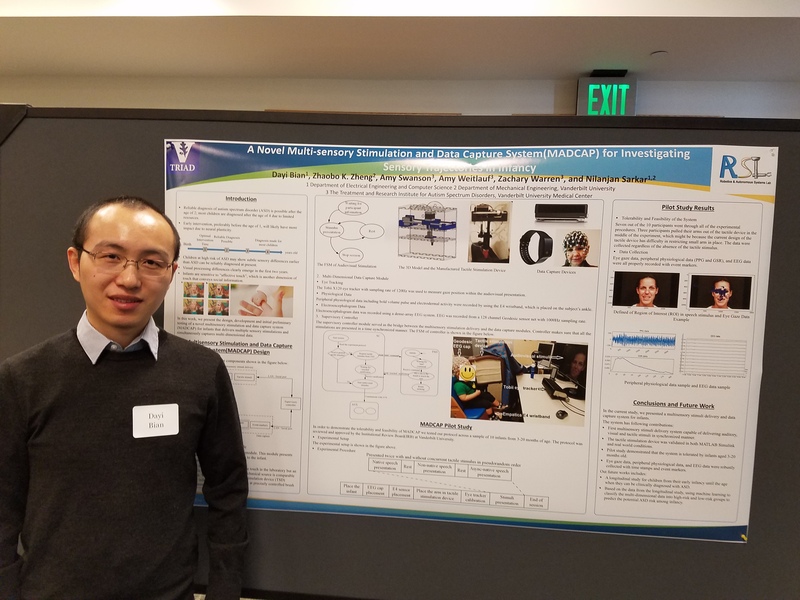 Congratulations to RASL member Huan Zhao whose article entitled Hand-in-Hand: A Communication-Enhancement Collaborative Virtual Reality System for Promoting Social Interaction in Children With Autism Spectrum Disorders was just published in IEEE Transactions on Human-Machine Systems! Click here for more information about her work on Collaborative Virtual Environments. Research News @ Vanderbilt published a story on Tuesday highlighting the IntelliCane technology developed at RASL. See the full story here. In August, a new Vanderbilt-led initiative entitled the “Vanderbilt Initiative for Autism, Innovation, and the Workforce” launched with a primary goal of facilitating the transition of adolescents with Autism into stable paid employment. This past Friday, the new group hosted a University-wide symposium to discuss a range of Autism-related research going on at Vanderbilt. 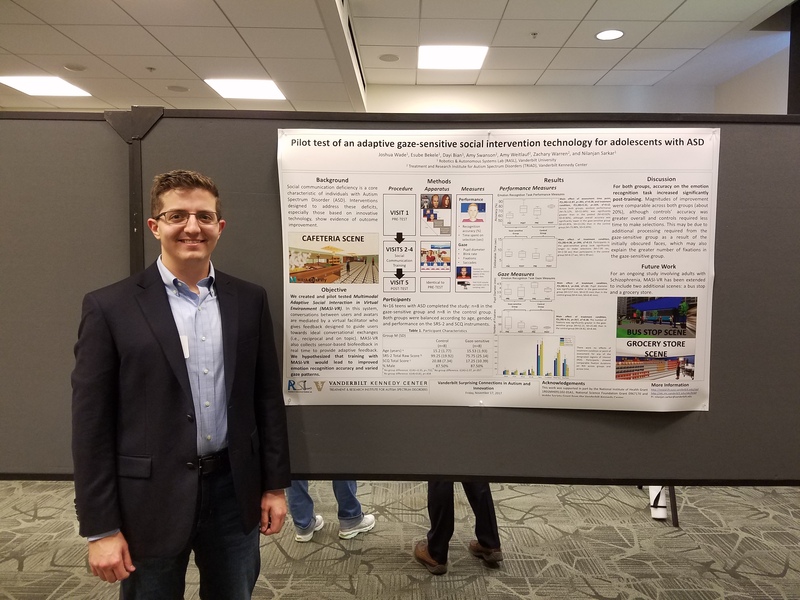 The “Vanderbilt Surprising Connections in Autism and Innovation” symposium, held at Peabody Commons, included speakers from the School of Medicine, the School of Engineering, and the Owen Graduate School of Management, as well as nearly two dozen poster presentations. 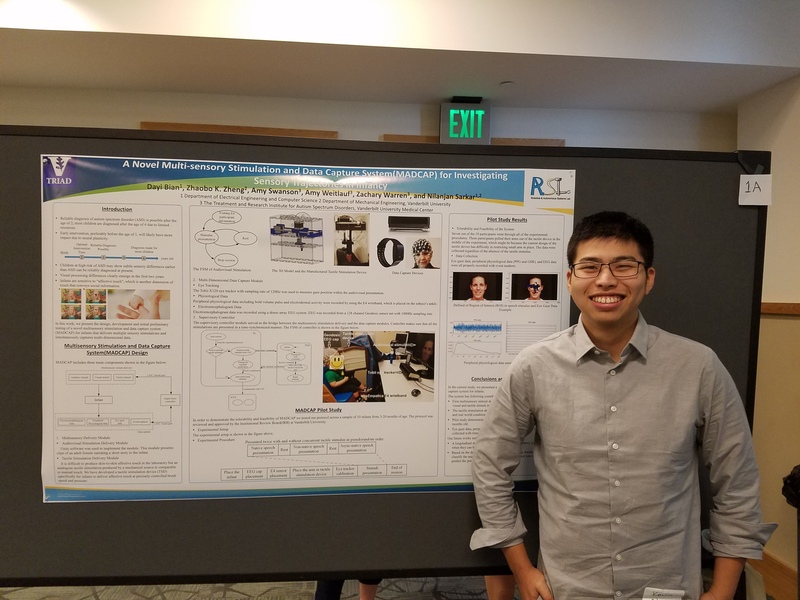 RASL members Zhabo Zheng, Dayi Bian, Guangtao Nie, Joshua Wade, and Huan Zhao presented posters for a variety of projects a the event. 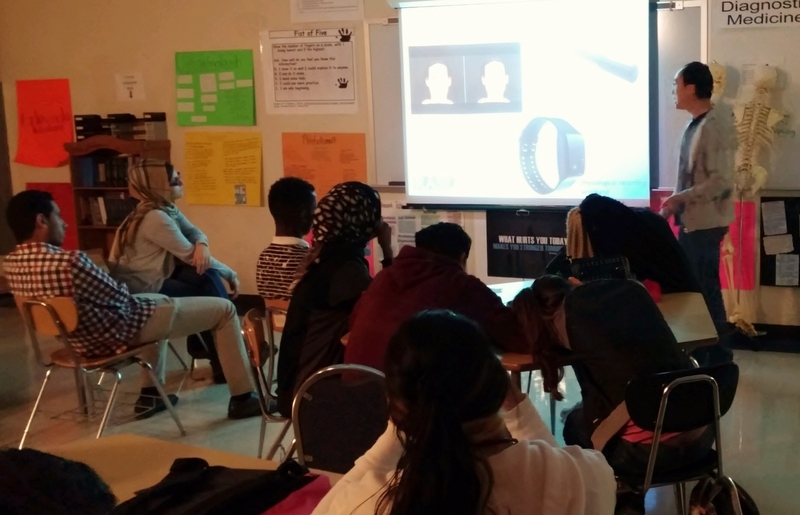 RASL members Nilanjan Sarkar and Joshua Wade took part in the 2017 TechVenture Challenge with their technology Alva: a gaze-sensitive driving simulator designed specifically for driving training in adolescents with Autism Spectrum Disorders (ASD). The two were joined by veteran business mentor Kei Gowda and a team of Vanderbilt students from various departments including business, public policy, and engineering. The TechVenture Challenge aims to provide both graduate and undergraduate students from a number of different disciplines with immersive, real-world commercialization experience. The pitch finals, which were held on April 13th in Nashville, consisted of five teams presenting their technologies. Team Alva took first place, earning a $3500 cash prize! J. Wade, L. Zhang, D. Bian, J. Fan, A. Swanson, A. Weitlauf, M. Sarkar, Z. Warren, and N. Sarkar, “A Gaze-Contingent Adaptive Virtual Reality Driving Environment for Intervention in Individuals with Autism Spectrum Disorders,” ACM Transactions on Interactive Intelligent Systems (TiiS), vol. 6, p. 3, 2016. L. Zhang, J. Wade, D. Bian, J. Fan, A. Swanson, A. Weitlauf, Z. Warren, and N. Sarkar, “Cognitive Load Measurement in a Virtual Reality-Based Driving System for Autism Intervention,” IEEE Transactions on Affective Computing, vol. 8, pp. 176-189, 2017. RASL members Huan Zhao and Dayi Bian presented two separate papers at this year’s Human Computer Interaction International (HCII) in Vancouver. Descriptions of both papers are given below. Zhao, Huan, et al. “Design of a Tablet Game to Assess the Hand Movement in Children with Autism.” International Conference on Universal Access in Human-Computer Interaction. Springer, Cham, 2017. Abstract: The high rate of atypical handedness and motor deficits among the children with autism spectrum disorders (ASD) have been repeatedly reported. Recently, tablet-assisted systems are increasingly applied to ASD interventions due to their potential benefits in terms of accessibility, cost and the ability to engage many children with ASD. In this paper, we propose the design of a tablet game system to assess the hand usage in movement manipulations of children with ASD. To play the games designed in this system, it requires good eye-hand coordination, precise and quick hand movements and cooperation with partners. The games can be played by one player using two hands or by two players each of whom using one hand. We present the system design and a small preliminary usability study that verified the system functionality in recording objective performance data for offline analysis of the hand usage of the players. Results showed that the proposed system was engaging to children with ASD and their TD (i.e. 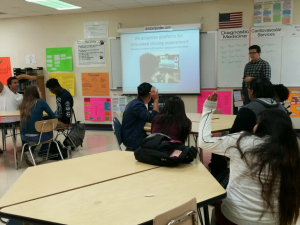 typically developing) peers, and could induce collaborative activities between them. The system was also shown to efficiently evaluate the usages of the dominant hand and the non-dominant hand of the users. We found that children with ASD showed different patterns of hand usage behaviors from the TD participants when using this system. Bian, Dayi, et al. “Design of a Multisensory Stimulus Delivery System for Investigating Response Trajectories in Infancy.” International Conference on Universal Access in Human-Computer Interaction. Springer, Cham, 2017. Abstract: Sensory processing differences, including auditory, visual, and tactile, are ideal targets for early detection of neurodevelopmental risk. However, existing studies focus on the audiovisual paradigm but ignore the sense of touch. In this work, we present a multisensory delivery system that can deliver audiovisual stimuli and precisely controlled tactile stimuli to infants in a synchronized manner. The system also records multi-dimensional data including eye gaze and physiological data. A pilot study of six 3–8 month old infants was conducted to investigate the tolerability and feasibility of the system. Results have shown that the system is well tolerated by infants and all the data were collected robustly. This work paves the way for future studies charting the meaning of sensory response trajectories in infancy. 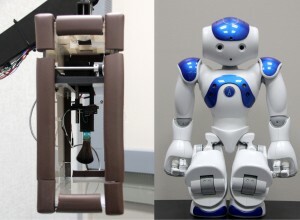 Robot-mediated Intervention Research Featured on ABC News! 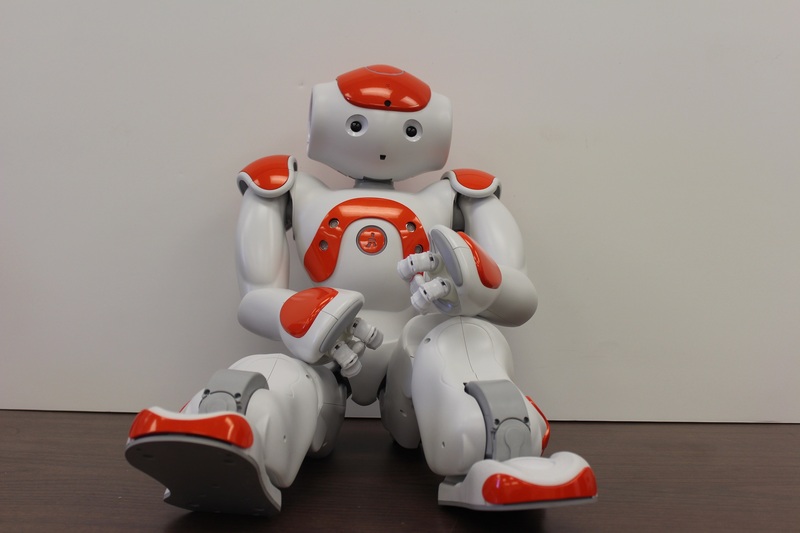 Robot-mediated social skills intervention for children with autism is an area of research pioneered by RASL director Nilanjan Sarkar and Zachary Warren, executive director of the Treatment and Research Institute for Autism Spectrum Disorders (TRIAD). Their recent work on this topic was featured on ABC News this morning. See the full article here. 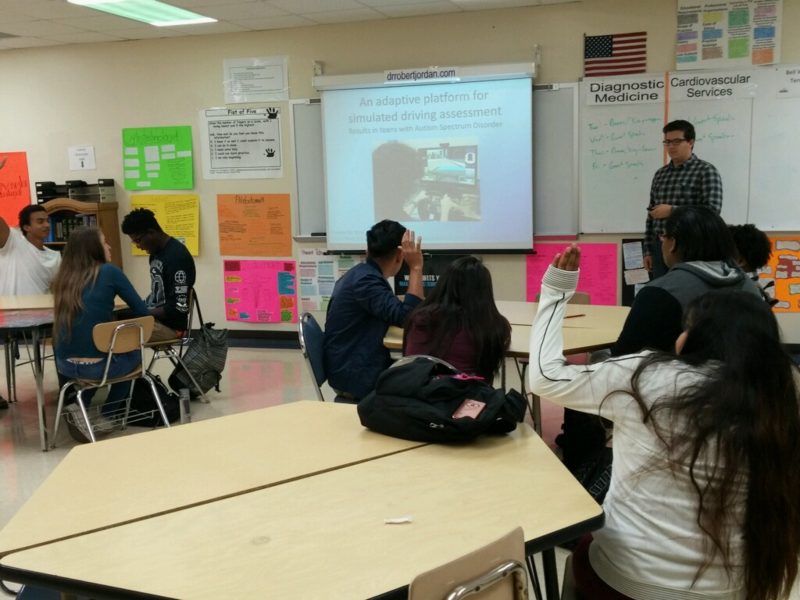 RASL members Dayi Bian and Josh Wade spoke to health science students at Glencliff High School on Wednesday. 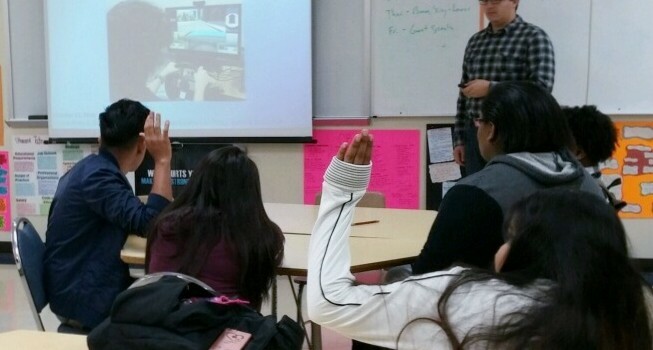 Many of the students are considering careers in healthcare, including roles in Psychology, Occupational Therapy, and Medicine. Research at RASL aims to address issues related to Autism Spectrum Disorder, as well as Schizophrenia, elder care, and mobility impairment. Students were also encouraged to get a jump start on their career preparation by getting involved in free MOOCs, such as edX and Coursera, as well as participating in Vanderbilt University’s research opportunities for High School students, including Vanderbilt Summer Academy and Vanderbilt Center for Science Outreach.